"There are 12 best practices shared by visionary fundraisers that power their outsized performance"
After methodically interviewing 200+ U.S. fundraising executives, we selected the top performers and identified the unique characteristics that correlate with high growth and performance. It turns out there are 12 best practices shared by these visionary fundraisers that power their outsized performance. 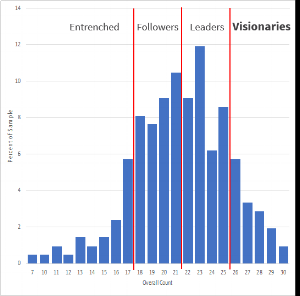 The Visionaries are the top 15% of fundraisers with the highest performing fundraising programs. Receive a free copy of the 2018 Fundraising Visionaries Report. Thanks for your interest in the 2018 Fundraising Visionaries Report.